The Republic of Korea’s landings of squid from the East Sea have declined over the past decade. In 2012, a total of 83 566 tonnes were landed, but this dropped to 75 660 tonnes in 2013. Further decline was registered in the following years, including 2016. Some are attributing this gradual decline to overfishing by Chinese vessels in the same area. The number of Chinese vessels fishing in the area has exploded, from just 140 vessels in 2004 to 1 900 vessels a decade later. The vessels, which are typically over 200 tonnes, are operating in the area under Republic of Korean licences, as the Chinese are paying fees to the Republic of Korean Government. However, the activity has created substantial tension between Chinese and Republic of Korean authorities as well as resentment among Republic of Korean fishermen. A recent incident, in which a Republic of Korean Coast Guard speedboat was sunk by a Chinese vessel, further aggravated the situation. Squid catches off of Peru have dropped dramatically in 2016 due to El Niño. Catches in some areas are down by as much as 70 percent compared with 2015. This development has forced some producers to focus on value-added production. Instead of selling raw squid and giant squid, some companies are now turning to processing and producing products such as cooked fins, boiled fillets, cooked tentacles and rings. By turning to these products, suppliers can increase prices by as much as 30 percent, thus compensating for some of the loss caused by the lower volumes landed. Previously, Chinese processors were buying raw materials from Peru and turning it into processed products, but in 2016, fewer raw materials were available for Chinese importers as more processing was done in Peru. At the same time, prices for processed products have increased sharply due to the low supply, and in some cases have grown by as much as 100 percent. These high squid prices are hitting the Chinese squid industry significantly. Chinese processors are finding supplies extremely difficult to come by, and import figures indicate an 80 percent drop in 2016 imports as a result. Furthermore, global demand for cephalopods is growing, thus putting even more pressure on prices. “Daruma”, a Peruvian squid product sold in China was sold at an average of US$4.30–5.00 per kg in 2016, dramatically up from US$1.50 per kg in 2015. These high prices are not compensating for the lower volumes, and as a consequence, several Peruvian companies are struggling financially. 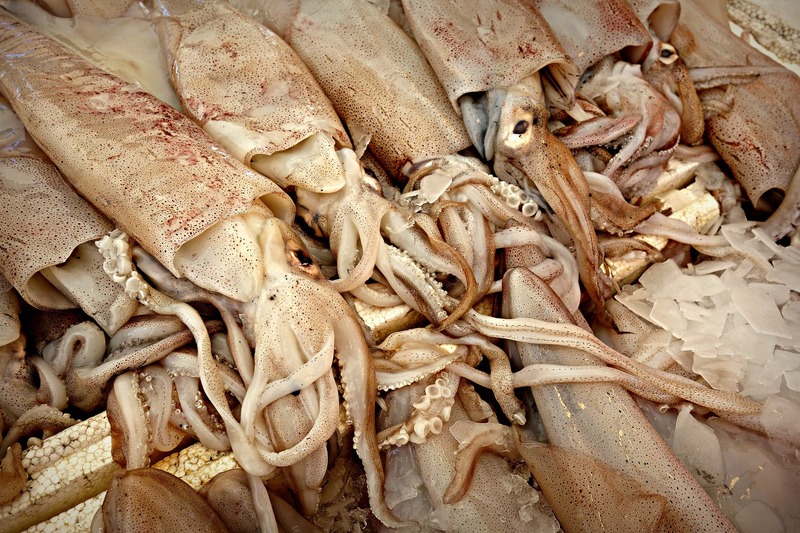 While global octopus trade was marked by a moderate decline in volumes traded during the first three quarters of 2016 compared with the same period in 2015, international squid trade saw some gains. Japan imported 3.6 percent more squid. The main supplier, China, held its position with 44 percent of the total, while the second largest supplier, Chile, shipped 50 percent more in 2016 (11 400 tonnes). Shipments from Peru to Japan dropped by 20 percent, while the Republic of Korea saw an upsurge in shipments to Japan: from 600 tonnes in 2015 to 4 500 tonnes in 2016. In Spain, imports increased by 14.7 percent to 72 500 tonnes during the first three quarters of 2016. The main squid suppliers to Spain, Falkland Islands (Malvinas), India and Morocco, held their relative positions, although the Falkland Islands (Malvinas) lost market share while the other two gained. There was little change in the volume of squid imported into the USA during the first three quarters of 2016, with the total reaching 52 200 tonnes, slightly down from 2015’s 53 800 tonnes. China is completely dominating this trade, accounting for 31 500 tonnes or 60.3 percent of the total.